To be useful, a metaphor must help understanding. For the promoters of Six Sigma to call their certification Black Belt was marketing genius. A more descriptive label might have been Staff Statistician, but what self-respecting manufacturing professional would want to be that? Borrowing a term from Japanese martial arts not only appealed to their fighting spirit, but also gave the impression that an approach developed at Motorola in the US had a connection with Japan, ground-zero of manufacturing excellence. Even in Japan, Black Belt (“Kuroto”) and White Belt (“Shiroto”) have migrated from martial arts to everyday language, to designate respectively a real pro and an amateur. As a metaphor, Black Belt also made sense because there is a parallel between the Six Sigma and martial arts training programs. Traditional masters in the martial arts of China trained one or two disciples at the Bruce Lee level in a lifetime, just as universities trained only a handful of experts in statistical design of experiments that could be effective in electronics manufacturing. One Karate instructor, on the other hand, can train hundreds of Black Belts, just as a Six Sigma program can teach a focused subset of statistical design of experiments to hundreds of engineers. Scrum, in software development, is also a sports metaphor, a term borrowed from rugby, which few Americans know. The connection between a rugby scrum and what software people call by the same name, however, is not obvious. A rugby scrum involves the forward players of two teams locked in the pattern of Figure 1. The ball is released in the middle of the scrum and both team try to take possession by kicking it backwards while pushing the other team forwards. It is exciting and bruising to participate in, as well as a great spectacle. 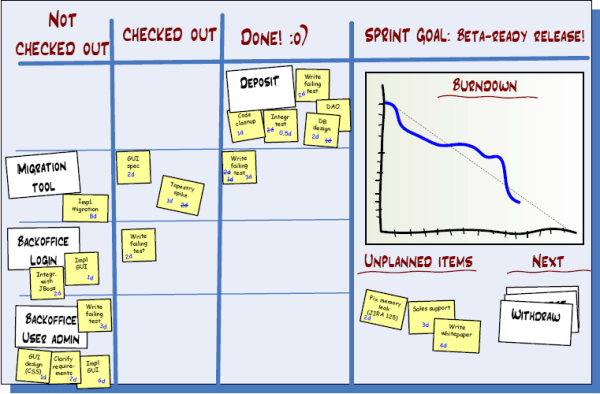 For software developers, scrum is an approach to project management illustrated by the status panel in Figure 2. It leaves you wondering what plays the role of the opposing team, the ball, or the player positions. In other words, in what way is a rugby scrum a metaphor for this approach at all? I agree with your opening sentence, which I think says it all. Metaphors must be useful. Too often, I think people like being cute with them, but that doesn’t make it helpful. I always struggled with scrum. I’ve heard people artfully explain the metaphor, but to the newbie, will it make sense? Doubtful. I’m not a big fan of black belts either, for a couple of reasons. First, it acknowledges individual achievement and that’s not what lean is all about. It’s perhaps fitting for six sigma, but then it also reflects a behavior too often found in six sigma programs: putting individuals on a pedestal, sometimes at the expense of the team contributions. Mixed metaphors are exactly what bewilders me when I hear talk of pigs and chickens doing sprints in scrums. The Lean folks like to show the Six Sigma folks as promoting elitism. But in all cases the name reflects only level of training and experience, but all of these are team activities. No man is an island. The customer is the winner. Variation and Waste are the enemy. Merging all these ideas and terms as needed for each team effort should be part of the DEFINE phase of management-team problem description. A name for that blended process of problem solving via team projects could be “Adaptive Learning System” otherwise known as LIFE. You are right, but only if it was meant to be a sporting metaphor. I have shown a sporting and commercial meaning of SCRUM. Would a person that understands one term see mutual reference in the other?. 1. Sports – in the sport of Rugby Union, it is a way of restarting the game, after an accidental infringement. 2. Project Management – is a loose set of guidelines that govern the development process of a product, from its design stages to its completion. So is it a metaphor or JAA (Just Another Acronym)? whoever is “inventing” these processes is recycling old knowledge in any event which is why none of it can be copyrighted, what next “line-out”, drop kick, infringement management????? Good discussion . I learned a lot from the facts . Does someone know if my assistant could possibly access a blank a form version to work with ?